Solar panels need to be cleaned a minimum of once per year, although some manufacturers recommend every six months. Regular cleaning of solar panels can yield a 30% increase in your solar panels’ electricity output, which far outweighs the cost of cleaning and, depending how many panels you have and your personal consumption, can lead to you selling your electricity back to the national grid. We will arrive on site with all of the necessary tools to clean and have your solar panels operating at their optimum output. 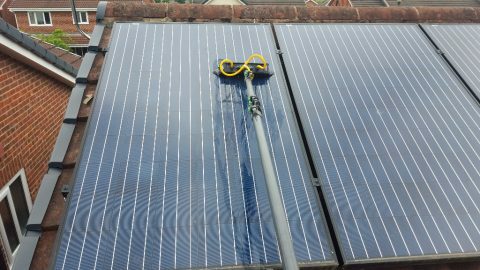 We use carbon fibre poles with specially manufactured solar panel cleaning brushes to clean your solar panels safely from the ground in most cases, with no damage to panels. We use 100% purified water which is known in the business as laboratory grade water. The purified water we use leaves the glass protective surface on your solar panels sterile so it is difficult for dust and debris to sick after cleaning.